Global management consultancy Accenture has acquired US data intelligence company Knowledgent for an undisclosed sum. Knowledgent uses machine learning and AI technologies to support clients through 'digital transformation' programs. The firm's Artificial Intelligence Lab is a hub for research, innovation, and collaboration on digital disruption technologies such as AI, machine learning, and Internet of Things (IoT). Based in New Jersey, it employs more than 300 'informationists' who provide data strategy, architecture, engineering and management solutions. 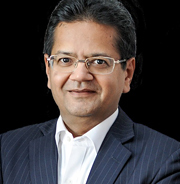 Bhaskar Ghosh (pictured), Group CEO, Accenture Technology Services, comments: 'We are in the midst of a data revolution, powered by new technologies. Enterprises are using data to gain deep insights into all aspects of their businesses and customers, and build a strong competitive advantage to gain market share. With the acquisition of Knowledgent, we can accelerate our data services to clients, using Knowledgent's top-notch talent, industry experience and proven data solutions'. Web sites: www.accenture.com and www.knowledgent.com .